Sarcopenia does indeed affect these muscles and, as anyone over 30 years of age has already noticed, losing muscle mass makes these everyday tasks more difficult than “when the body was younger!” Walking up stairs becomes a struggle; walking back up the hill toward your house leaves you breathing heavy, doing some basic garden work hurts your back… And the worst part is that it only gets worst as the years go by. Lack of exercise is one of the major factors causing Sarcopenia. People who are not physically active as they age, will lose as much as 3% to 5% of their muscle mass per decade after age 30. 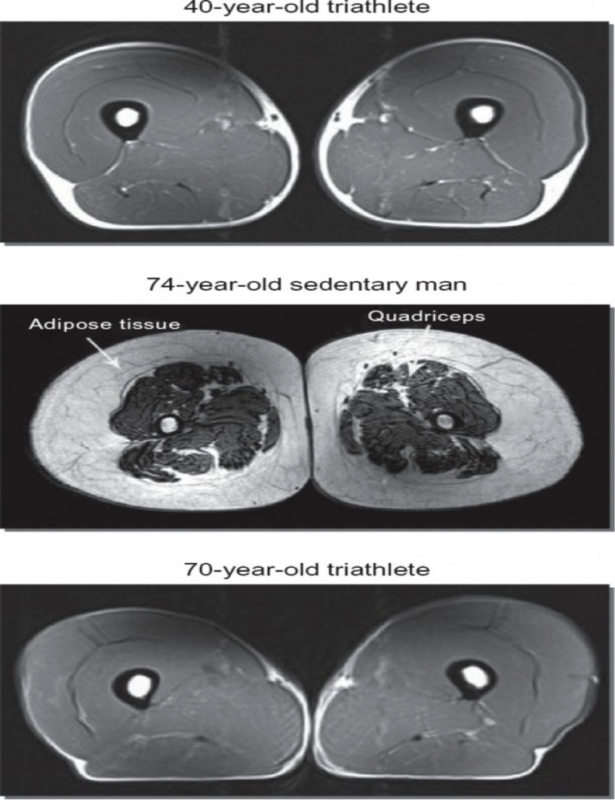 Here is a picture showing the cross-sectional images of the thigh muscles of master athletes. The study done by Dr. Vonda Wong and her colleagues showed the importance of continued lifelong activities! The primary treatment for Sarcopenia is regular resistance / strength training. Research has proven that people who continue to exercise regularly during their adult life exhibit a much more progressive loss of muscle mass. 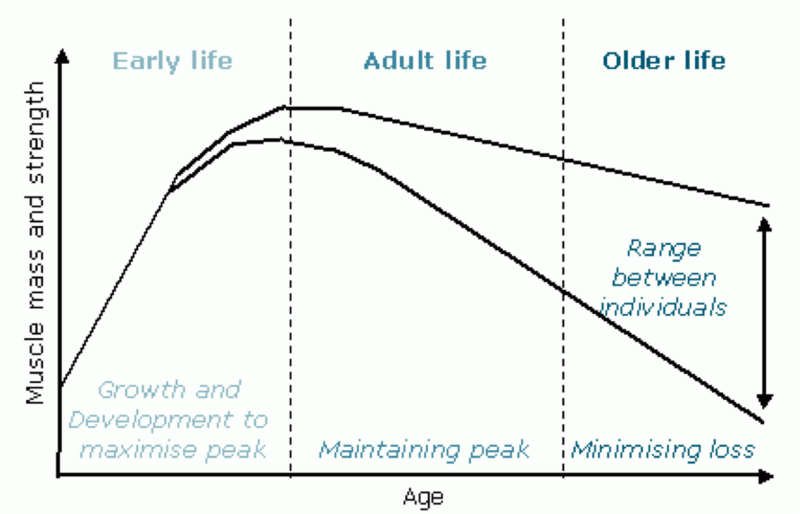 Therefore, the solution to “Defying the aging process” and remaining strong and active seems to be quite simple. Regular resistance training workouts will keep your muscle active, flexible and strong. Muscles need to be activated regularly to be kept in good working order. And since further studies have shown that exercise only preserve the muscles you actually use ( use it or lose it), you need to adhere to a full body workout plan! Since our lifespan is continually expanding and many people have worked hard to ensure they have financial freedom for the senior years, wouldn’t be nice to be able to also enjoy physical freedom and be able to fully enjoy getting older!! There are many different ways to keep your muscles mass activated and strong : group sports – fitness classes – gym workouts – personal fitness coaching…. Find the one or the ones which is/are suitable to you and your budget and get started right away! Join the growing numbers of people who have decided to “Defy Aging” and remain young of Body & Mind for a long as possible! This entry was posted in Fitness Blog on August 1, 2014 by bodyagefitness.